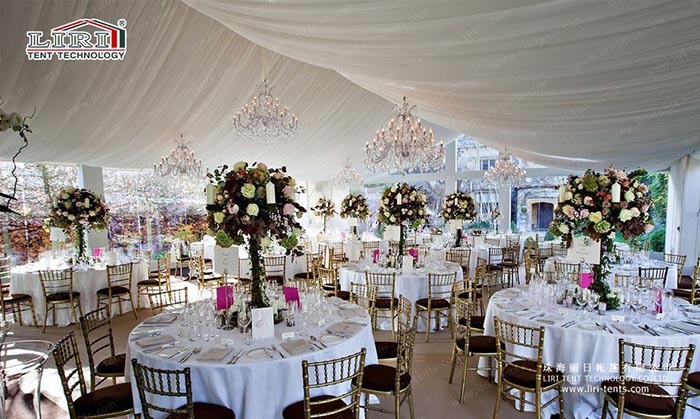 Event chairs and tables are very essential for party tents design, which make tents inside more unique. Different kinds of event furniture are suitable for different kinds of parties, such as weddings, festivals, exhibitions, banquets, etc. Chairs and Tables for Tents are not only functional products, but also core decorations for a tented party. Liri Tent provides one-stop service for event rental from event tents, tables and chairs, air conditioners, dance floors, etc. Therefore, there are many styles of chairs and tables for parties. Liri Tent is the first and largest tent manufacturer in China. The main products of Liri Tent is tents and marquees. They are popular for different events, like weddings, parties. To meet our customers’ need to access one-stop shop for events, We also provide event furniture in various styles such as chiavari chairs, banquet chairs, round folding tables, rectangle folding tables, chair cover and table cloth. Available colors include crystal, golden, white, grey, yellow, red, blue, green, pink, etc. The chairs and tables which perfectly match with liri tent series can be widely used for weddings, parties, ceremonies, exhibitions, festivals, celebrations, caterings, and other kinds of events. If you are interested in these chairs and tables for tents, just SEND your detailed product inquiry below. We will get back to you as soon as possible.